One of the products of Seacom’s undersea cable reaching East Africa is that we’re now getting faster internet, and more of it, in Nairobi (note, I didn’t say cheaper). For many, it means coming up with a plan for backup internet is plausible and it’s actually quite easy. Though more expensive than an ethernet connection, the mobile carrier’s with 3G internet access work well for this. Plus, they have the added advantage that you can take the modem with you and have mobile connectivity anywhere. This time, I wanted to get a router that I could connect my Safaricom (or other) 3G dongle into and provide internet for more than one device and backup for my other “main” connection. 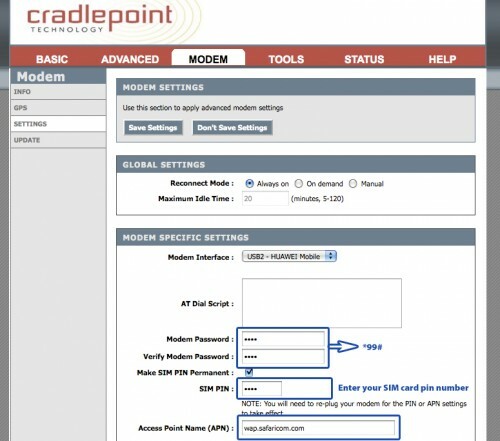 With this thought in mind, a couple weeks ago I picked up a Cradlepoint MBR1000 router due to it’s ability to accept 3G modems, whether USB, ExpressCard or phone. It’s interesting to note that Cradlepoint also have a battery operated version for those really on the go, making it a completely wireless hotspot in your pocket. You can read more about this in a case study [PDF} where some university students from Canada used this in conjunction with Safaricom 3G modems and the OLPC while upcountry. Will this work with Zain and Orange? I’m not sure yet, but I’d tend to think that it should. 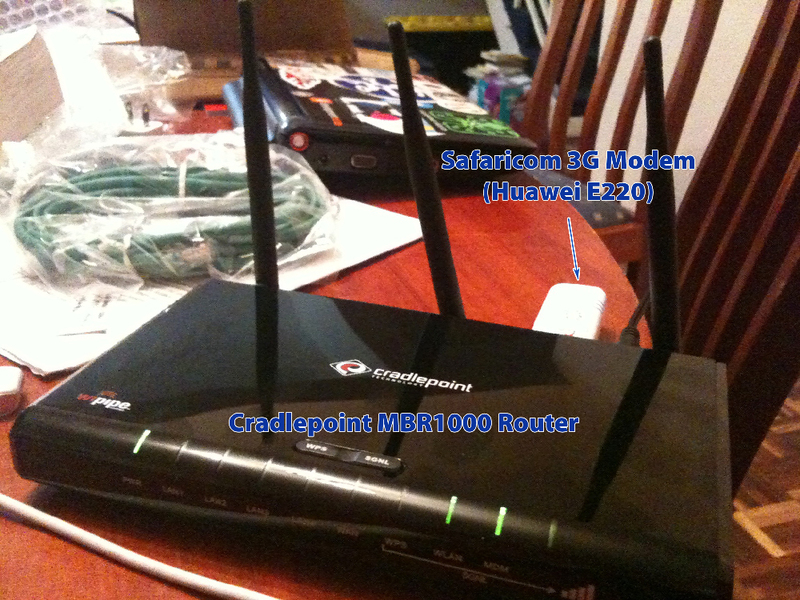 I’m using the Huawei e160 modem for Safaricom, and Zain uses the Huawei e220, which is also listed under Cradlepoint’s generic UMTS/GSM devices. Great idea! Does your dongle have a socket for an external antenna? Heh, where’s there’s coverage of course. I remember sitting in the food court with you in the Accra airport as you got that one blip of proper speeds after a week of dread on Zain. Hope that the 3G grid is better in Nairobi. Also, those Cradlepoints are awesome. I used one with Verizon in the US briefly. Not cheap, but a must-have for the geek on the go. Yup, that USB modem does have the antennae port. I’ve never seen any for sale in Nairobi, but I’m sure they could be found. Personally, I’ve never found external antennas to be very helpful. Mainly helpful to position the antenna outside or something like that. Thanks for the info. I have been thinking of setting up router to use, especially should Safaricom offer unlimited package. Unfortunately I haven’t noticed any benefit of the fiber optic cable here in Nakuru. My next pet project is to hack an antenna for this Huawei e160 – unless I can find a prefabbed one locally. Where I live now I get 1-2 bars which isn’t optimal. If I could put an antenna on the roof and just plug into it when I get home, that would be the best solution. Johnny, I’d think that Nakuru would be one of those secondary markets where you’ll start seeing speed increases as the networks finish up in the main hubs of Nairobi and Mombasa. Until then, I guess it’s only EDGE connections for you if you’re going through the mobile operators. @Zulusafari: thx for the info! Maybe a Skunkworker knows where to get them? You could also build your own, but I think the problem will be to get the thin cable and the plug. The antenna itself can even be done jua kali – the interesting part is building them and seeing which array (Yagi, Cigar, etc.) will be the one with the best antenna gain (dBi). Or maybe an extension cable between the router and the usb modem will also already do the job – just a short one, these router usb ports are often chronically underpowered (< 500 mA). Or use a powered hub? Maybe this way you'll have less interference between the 2.4Ghz & ~1.9-2.2GHz ranges. I am with Zulus. though when he said that most of these antennas don't make such a big difference. But maybe the ones I've tested where 0dBi antennas and more omni-directional. Living in .DE, I would of course only buy them off-the-shelf, also due to the tiny antenna plugs which are a pain to solder. I think I would even order them from eBay, or at least scan it for DIY instructions/inspirations. Isn't there a fundi / student in Nbo who builds such antennas and has already done the testing? I’ve fabricated antennas from scratch before and had my best success with omni-directional ones. We’re not dealing with any variation in the spectrum here either, so once I’ve established the wavelengths setting up a spider web will be my first experiment. I had a chance to get one of these (or the previous model..not sure which) in May. Called Cradlepoint and they told me in no uncertain terms not to bother buying the thing because Safaricom/Huawei combo was not one of the combos it is programmed/designed/allowed to work with. I’m no techy so I took them at their word. I was not willing to gamble spending $300 on something I couldn’t guarantee would work well. 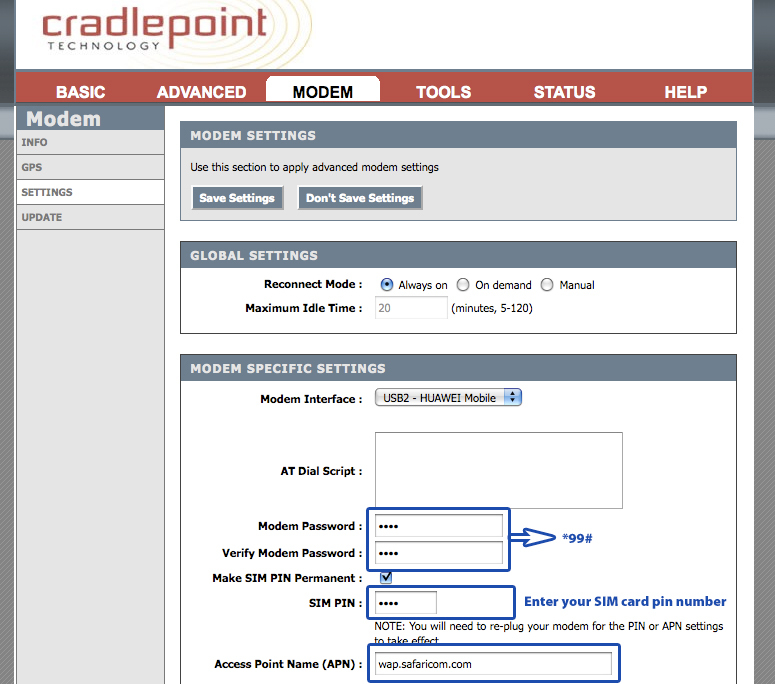 Is there no way to rig a normal wireless router to work with a 3G/HSDPA modem? I stumbled across this looking for a modem with a USB-in. Would you let us know how it goes with the antenna. My 3G coverage is pretty poor…would be interested in one of those (or instructions on making). I use the e220. Edimax is a 3G router and currently using it with a Safaricom sim and its excellent, not sure if 3g router are sold here in Kenya except for the safaricom’s one. what is a shame. Maybe I should start a business. Anyone currently using a Huawei E5 (e5830) MiFi modem in Kenya? It seems perfect for truly mobile broadband access, for up to 5 devices and should work Safaricom when unlocked. Hopefully will have one in a few weeks to test. I know this is an older thread… but- I just arrived in Nairobi with my cradlepoint MBR1000… I bought a safaricom modem and thought it would work.. they sold me a huawai e173.. I am not able to make it work with the router… Any advice? Are you here in NBO? Anyone here that might be able to talk me through the installation? Thanks!